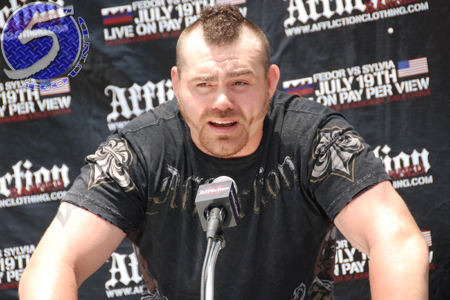 Lost in the hoopla surrounding Saturday’s UFC 182 event was the fact former UFC heavyweight champion Tim Sylvia (pictured) retired from mixed martial arts. Sylvia chimed in and stated he dropped $2,000 on tests just to compete before getting shunned. It has been reported by multiple outlets that The Mohegan Athletic Commission wasn’t comfortable allowing Sylvia to fight after examining his MRI. “The Maine-iac” owns a 31-10 (1 NC) record. Fans remember him best for his days as the off-and-on UFC heavyweight champion between 2003-2006. Sylvia was released by the UFC following a submission loss to Antonio Rodrigo Nogueira in February 2008. Nine of his 13 UFC bouts were of the championship variety. The 38-year-old goes out riding a three-fight losing skid.